If some glitch occurs sporadically but isn’t happening when you’re looking for it, the chances are low that you’ll discover the root-cause of the problem. On top of that, most networks are large and complex – problems can occur anywhere in the environment, for any number of reasons, and you may not even be aware of it. While it is much easier to identify a problem, the difficulty lies in how to resolve it. 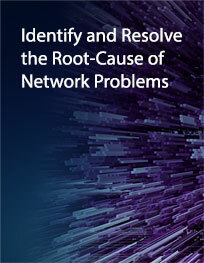 Download this white paper to gain an understanding of how to identify and resolve the root-cause of network problems.